There are 124 Challenges that await you in Super Smash Bros. Ultimate, presenting objectives that you can set out to complete to earn rewards while spending time with the mascot brawler. Whether you’re sinking time into Smash, Adventure, Spirit Board, Spirits, Classic Mode, Games & More, Online or Other, these are both momentary and sometimes lengthy milestones for you to set out to achieve. We have looked to help you as best we can, in listing out every Challenge in Super Smash Bros. Ultimate and, where possible, the reward that you will receive once they have been completed. Challenge: Finish a Squad Strike. Challenge: Beat a Lv.3 CPU in a two-player battle. You must have a 300 percent handicap, the CPU must have a 4 percent handicap, and spirits must be disabled. Challenge: Beat a Lv.5 CPU in a two-player battle. This must be done with 500 stamina, with no spirits, and without handicaps. Challenge: As Pac-Man, get a score of 7,650 with Final Smash. Challenge: As Cloud, hit an opponent with side special, Cross Slash, while the Limit Gauge is charged. Challenge: Beat a Lv.5 CPU by at least three points in a two-player battle. This must be done within three minutes, with no spirits, and without handicaps. Challenge: Play Custom Smash with five or more special conditions. Challenge: Against four Lv.9 CPUs, KO three opponents with a meteor smash. This must be done within three minutes, with no spirits, and without handicaps. Challenge: Reach 250 percent or more damage during battle. Challenge: Beat a Lv.5 CPU in a two-player battle. This must be done with two or more stocks remaining, with no spirits, and without handicaps. Challenge: Battle with eight players. Challenge: As Incineroar, deal 40 percent or more damage to an opponent with a single attack. Challenge: As Inkling, bury a Lv.9 CPU into the ground three times with side special, Splat Roller. Challenge: As Isabelle, damage an opponent five times in a single battle with side special, Fishing Rod. Challenge: Beat a Lv.9 CPU in a two-player battle. This must be done with two or more stocks remaining, with no spirits, and without handicaps. Challenge: As Little Mac, hit an opponent with a KO Uppercut in Boxing Ring. Challenge: KO three people within 10 seconds of starting in Super Sudden Death. Challenge: KO an opponent by hitting them with a 9 from Mr. Game & Watch’s side special, Judge. Challenge: Beat a Lv.5 CPU in a two-player battle. You must have a 300 percent handicap, the CPU must have a 0 percent handicap, and spirits must be disabled. Challenge: As Ridley, use down special, Skewer, for a critical hit on an opponent four times within a single battle. Challenge: As Robin, use a flurry attack to KO a Lv.9 CPU in a two-player battle. This must be done within three minutes, without spirits, and without handicaps. Challenge: Beat a Lv.9 CPU in a two-player battle. This must be done with 500 stamina, with no spirits, and without handicaps. Challenge: Beat a Lv. 3 CPU by at least three points in a two-player battle. This must be done within three minutes, with no spirits, and without handicaps. Challenge: As Simon, use a Final Smash. Challenge: Finish a 32-participant Tourney with a human player as the winner. Challenge: KO an opponent by using an item. Challenge: Get three KOs within the first minute of a battle. Challenge: Beat a Lv.9 CPU by at least three points in a two-player battle. This must be done within three minutes, with no spirits, and without handicaps. Challenge: Rescue 30 Spirits in Adventure Mode. Challenge: Obtain all Adventure Skills. Challenge: Win in the final round without being KO’d. Challenge: Battle in Adventure Mode and rescue 100 spirits. Challenge: See the true ending. Challenge: As Ganondorf, clear the first stage of the final battle without being KO’d. Challenge: Start New Game +. Challenge: Remove all obstacles in the Light Realm. Challenge: Win in all the battles. Challenge: Remove an obstacle on the map using a spirit’s abilities. Challenge: Open 20 treasure chests. Challenge: Rescue 60 spirits in Adventure Mode. Challenge: Obtain an Adventure Skill. Challenge: Seek out a bounty target 30 times. Challenge: Win against a Legend class 10 times. Challenge: Challenge an Advanced class 10 times. Challenge: Have four or more bounties waiting to appear. Challenge: Win against a Legend class. Challenge: Win against an Ace class. Challenge: Win against a Novice class 20 times. Challenge: Win against an Advanced class three times without using a spirit team. Challenge: Use a battle item 10 times. Challenge: Use 10 board items on the Spirit Board. Challenge: Get 3,000 Spirit Points (SP). Challenge: Use a spirit team in a battle against a Spirit Board opponent. Challenge: Free 10 spirits in a row without using Free the Spirit items. Challenge: Collect 777 unique spirits. Challenge: Get 10 cores from dismissing spirits in Dismiss. Challenge: Collect 10 unique Spirits. Challenge: Leave a spirit at Explore three times. Challenge: Leave a spirit at the Dojo three times. Challenge: Obtain a Legend class by using Summon. Challenge: Leave a spirit at the Gym three times. Challenge: Enhance a spirit five times in Level Up. Challenge: Sell items five times in Items. 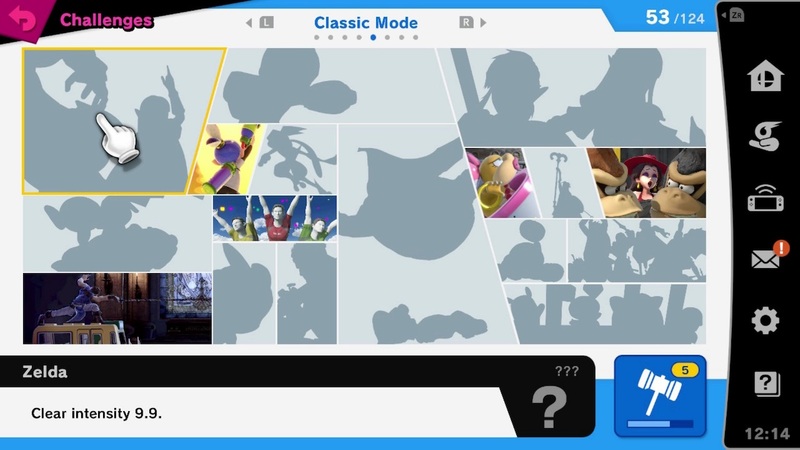 Challenge: Clear Classic Mode with an Intensity of 3.0 or higher. Challenge: As Greninja, score 98,000 points or more in Bonus Game. Challenge: Get 1,400,000 or more points in the credits. Challenge: Play eight total rounds of Team Battle. Challenge: As King K. Rool, reach the goal in Bonus Game within 45 seconds. Challenge: Defeat the Demon King, Ganon. Challenge: KO fighters from Fire Emblem 20 times. Challenge: Obtain five recovery items and clear Classic Mode. Challenge: As Mega Man, clear Classic Mode. Challenge: As Palutena, clear Classic Mode. Challenge: KO fighters from Pokémon 20 times. Challenge: KO giant fighters five times. Challenge: As Snake, clear Intensity 5.0 without using any continues. Challenge: KO a total of 15 opponents in Horde Battle. Challenge: Use a ticket three times. Challenge: Get three KOs in Cruel Smash while playing solo. Challenge: As Ken, clear Century Smash alone using only special moves. Challenge: Play Century Smash alone on Great Plateau Tower, and clear it within five minutes. Challenge: As Luigi, play solo All-Star Smash and deal damage with a taunt three times. Challenge: Play All-Star Smash alone, and KO an opponent with a meteor smash. Challenge: Play Century Smash alone and clear it within four minutes. Challenge: Get 20 continuous hits in Training. Challenge: Play All-Star Smash alone and KO an opponent three times. Challenge: As Wolf, clear Century Smash alone within five minutes. Challenge: Complete 200 Quickplay battles. Challenge: Use at least 10 different fighters in Quickplay. Challenge: Complete 50 Quickplay battles. Challenge:Defeat an opponent with a higher Global Smash Power than you 10 times in Quickplay. Challenge: Defeat an opponent with a higher Global Smash Power than you 5 times in Quickplay. Challenge: Use at least 30 different fighters in Quickplay. Challenge: Get a total of 100 KOs. Challenge: Participate in 10 arena battles. Challenge: Get 3 KOs in a single Quickplay battle. Challenge: Claim 5 Smash Tags. Challenge: Complete 100 Quickplay battles. Challenge: Claim 50 Smash Tags. Challenge: Have access to 750 or more music tracks in Sounds. Challenge: Acquire a total of 7,777 Spirit Points (SP) or more. Challenge: Acquire a total of 5,000 Gold or more. Challenge: Create three Mii Fighters. Challenge: Have the game powered on for a total of 20 hours. Challenge: Purchase an item during a Sunday sale in the Vault Shop. Challenge: Create a playlist in Sounds. Challenge: Get 10 types of Mii Headgear. Challenge: Get 10 types of Mii Outfits. Challenge: Unlock 10 fighters, other than Mii Fighters.